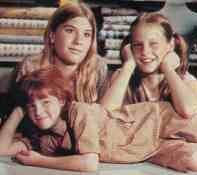 Judy Norton (Mary Ellen), Mary Elizabeth McDonough (Erin), and Kami Cotler (Elizabeth) appear in the early days of Waltons Mountain. The picture was reproduced from a magazine article dated November 20, 1993. Brother Albert is minister graduated Jerome College in Savannah s7/e15. Cousin Mary Margaret Fitz s7/e20. Uncle Lucas (mother's eldest brother) s8/e8. Spinster Aunt Mitilda lives Doe Hill 5/9/82. Miss Emily often said, "Don't you know!" Miss Mamie often responded by saying, "Oh, Emily!" Miss Emily first kissed by Ashley Longworth on her nineteenth birthday (October 19) The Homecoming Pre-	2; she often said that he kissed her "out there under the maple tree and a shower of golden leaves swirled about in the autumn wind" s3/e21. Grandfather was called "The Colonel"
Cousin Tyrone is from Buckingham County who was confined for driving his home-made chariot around his neighborhood s1/13. The license plates for the sister's car are 79-982 Virginia s1/e12 & e13. Cousin Raymond wrote risque books, adored basket weaving, had to leave town after a scandal. Second husband Harley Foster (first met in s2/e5). Husband of Louella, First wife died s5/e12. Graduated with Bachelor of Barbering degree s7/e12 (business isn't well after cutting off Casper Farley's earlobe). Husband of Sissy. Married in The First Casualty s6/e8. Brother-in-law Willie, wife Marta, daughter Katrina (relocated from Germantown, PA, live in old Montgomery place) s6/s14. Mail box outside Miss Fanny's house is "F. Tatum Route 124"
Wife of Rev. Marshall (married during movie).